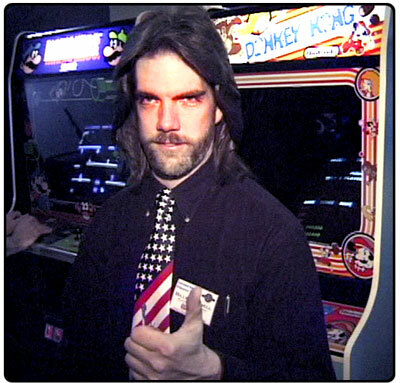 The King of Kong: A Fistful of Quarters was the sleeper documentary of 2007, and it remains a hilarious and engaging story about who holds the championship score in Donkey Kong. While some of accused the director of chicanery to make a better story, it remains as entertaining as hell. I watched it again with Milky the other day, and now we’re planing a pilgrimage to The Funspot, up in New Hampshire. Listening to the old champs talk about the golden age of arcade games in the ’80s made me wax nostalgic. I always liked the vector games- the line drawn ones- such as Tempest, the classic Star Wars, Asteroids, and so on. Dig Dug, a ridiculous game with a guy in a spacesuit digging in gardens and fighting dragons and pookas- who looked like tomatoes with Velma glasses on- using an air pump to explode them, was another favorite. I was too impatient for Frogger and Donkey Kong, which take a bit of strategy- you can’t just charge forward. It’s on like Donkey Kong, in this excellent documentary. The basic story involves Billy Mitchell- the mullet-sporting record holder of Donkey Kong since the ’80s, and Steve Weibe, a challenger who bought a Donkey Kong cabinet and practiced in his garage. He submits a tape of breaking 1 million points to Twin Galaxies, the home of the 1982 Video Game Championship and the recognized repository of authenticated high scores, and causes enormous controversy due to what I like to call fandom drama. The score is validated by Robert Mruczek, a guy who watches high score videos for much of his life, and the battle begins. 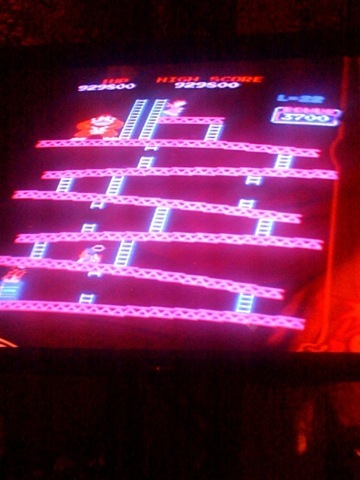 Billy Mitchell is no longer the King of Kong. Immediately he begins damage control. 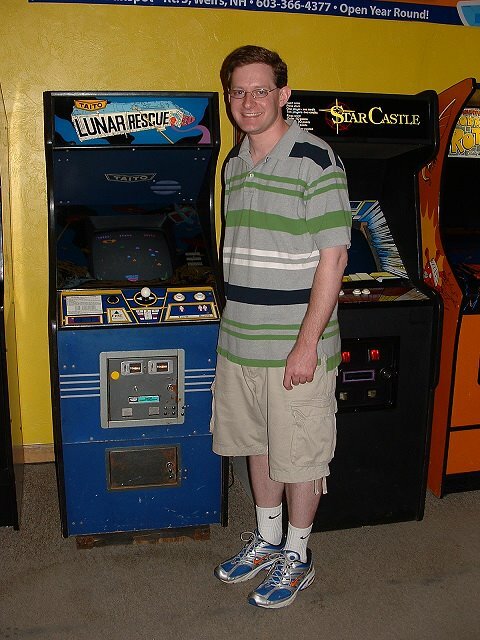 3 guys go to Steve Wiebe’s house when he’s not home, and ask to see the arcade game, to verify it. Steve’s wife says they have to wait for him to come home, and she goes to work- so they ask her mother, and get to see the machine without Steve present. For sabotage? Who knows? They find a box linked to a man called Mr. Awesome, and the drama explodes. See, Steve’s Donkey Kong board died and he got a new one from Roy Schildt- a guy who likes to be called Mr. Awesome – a Missile Command top player who has a rivalry with Billy Mitchell, and apparently a restraining order against him. This taints Steve’s score, and brings his honesty into question. So Steve travels to a neutral zone- The Fun Spot in New Hampshire, and publicly beats Billy Mitchell’s score, though not topping one million. Billy’s fanboys are present, most notably the annoying as hell Brian Kuh- and they try to psych him out. But he still succeeds, getting a kill screen and a record score in front of witnesses. The glove has been thrown. Brian Kuh, who comes off as Billy’s lackey. 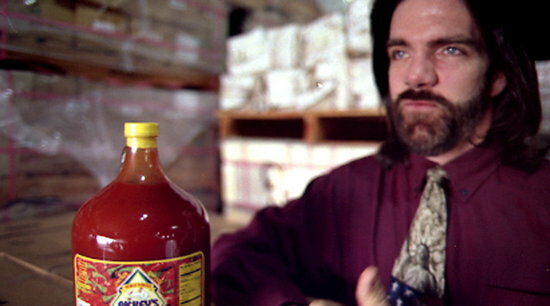 Billy Mitchell- the former kid video game star- now runs a couple of chicken wing joints in Florida. Immaculately styled hair, full beard, black jeans and a dress shirt with an American flag tie- make him hard to miss. He’s the kind of guy you immediately peg as douche, full of childlike bravado and self-promotion. The film does play a little fast and loose to make Steve an underdog and Billy a has-been who won’t defend his title in public, but certain things are undeniable- Billy’s tape has suspicious “tracking problems” that got overlooked by the judges. In fact, the judge retired after the debacle. of Mr. Awesome’s bodybuilding days and his “how to pick up girls” videos. In Chasing Ghosts, you get a lot more detail, so much you’ll be averting your eyes. Trust me. It verges on “things you can’t unsee.” King of Kong may be a bit creative but all documentaries have agendas, and it makes for an incredibly entertaining look at an obsessive subculture.